Like mankind’s first trip to the moon in 1969, the completion this spring of the world’s first 3D printed excavator is the very visible finish line of a long and complex journey. And, like the lunar landing, reaching the finish line will ultimately end up being less important than the lessons learned along the way. In March, the Association of Equipment Manufacturers (AEM) and its team of partners unveiled the world’s first 3D printed excavator at the International Fluid Power Exposition (IFPE) as a proof of concept. The technology, more formally known as additive manufacturing, is the process of using automation to build an object from a computer model by successively adding layer upon layer of material, and could revolutionize the way components are made for the heavy equipment, aerospace and other industries. But the experts seem to agree that the immediate potential of additive manufacturing is in smaller-scale deployments. Love headed the three-year partnership behind Project AME (Additive Manufactured Excavator, pronounced “Amy”) a collaboration between AEM, the National Fluid Power Association, the Center for Compact and Efficient Fluid Power, Oak Ridge National Laboratory the University of Minnesota and the Georgia Institute of Technology, in addition to industry supporters. Together, the coalition tackled the enormous proof of concept—that, through the still-developing field of additive manufacturing, large-scale components in heavy equipment could be created out of steel, aluminum and composite plastics. 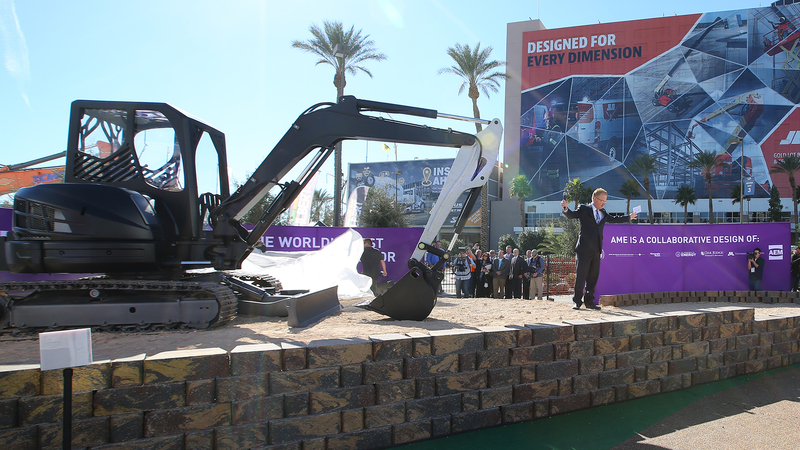 The results spoke for themselves, as the completed excavator demonstrated its effectiveness to crowds of spectators at IFPE and the CONEXPO-CON/AGG Tech Experience. But what was not immediately evident when they fired up the pioneering piece of equipment was that it represented the seamless integration of three very different emerging 3D printing technologies. The seven-foot, 400-pound steel stick of the excavator is the most exciting innovation on the project, in Love’s opinion. Using a first-of-its-kind large-scale deployment of 3D steel printing technology, Oak Ridge and Wolf Robotics built the steel part in just five days, based on a design by engineering students at Georgia Tech. Different, more traditional methods of additive manufacturing were responsible for other components of Project AME, albeit on a larger-than-typical scale. The rig’s 13-pound hydraulic heat exchanger and cooling system was printed in aluminum using a laser powder bed fusion system, where aluminum powder is raked over an area and melted into place with a laser, layer by layer. And the excavator’s cab was printed out of composite plastic on the Cincinnati, Inc. BAAM system, which melts plastic pellets and deposits the material through a robotic nozzle. While the completion of Project AME proves that additive manufacturing technology is fully capable of producing large, high-quality parts out of affordable material, Love says it’s not ready for mass production yet. But even now, Love sees specific applications for additive manufacturing in the heavy equipment manufacturing sector. With its reputation for building machinery that stays in use for decades, he notes that OEMs are forced to spend heavily on keeping massive inventories of spare parts on hand, ready for delivery in the event of a customer’s order. Already, Love says companies are exploring opportunities to find savings by cutting back on the overhead costs of warehouse space through 3D printing. The expensive and time-consuming process of tooling is perhaps an even greater opportunity for additive manufacturing to create efficiencies, Love says. The production of molds, jigs and fixtures used in the mass production of heavy equipment can take months, run six-figure costs and very often involve overseas tooling companies. But Love believes that the widespread adoption of additive manufacturing could change all that. As a research fellow at Oak Ridge National Laboratory, Love invites representatives of any manufacturer to schedule an appointment to tour the facility and learn more about the technology. Funded by the U.S. Department of Energy, the lab is intended to help give U.S. manufacturers a competitive edge on the global scene, and companies hoping to implement additive manufacturing in their business plan can qualify for assistance and guidance from Oak Ridge at no charge to the company. Love sees equipment manufacturers’ initial hesitance to adopt the technology as patient caution. In partnering with AEM on Project AME, he hopes to have demonstrated to the industry that 3D printing is more than just a catchy buzzword or a flash-in-the-pan trend. “I think this is a conservative industry, and for good reason,” Love says. “You make things that last 50 years. You don’t do that by being rash, you don’t do that by rushing out and trying something new. Learn more about 3D printing applications and much more at SpaceCom 2017 – register now!